Last week, Blondie turned 6! 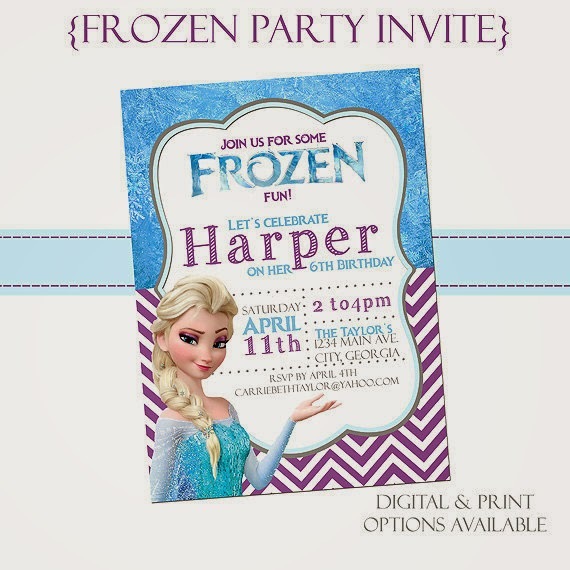 To celebrate, she wanted a Frozen themed birthday party. How original, I know. But, after some Pinterest searching I got excited about the party and now we are just days away. I thought I would share some of my planning and prep that is taking place this week because that is pretty much all I'm doing this week. Next week I will share all of the details about the party! I started my party planning like always do...by asking Jen to create some adorable invites and of course she delivered a precious product that made my girl smile from ear to ear. Blondie's favorite colors are purple and blue so it was easy to take those colors from the movie and run with it. Anyway, back to the party planning. I bought THIS pettiskirt from Amazon for her and made a birthday shirt to coordinate. While I was at it, I also made a burlap garden flag to hang and welcome her party guests. 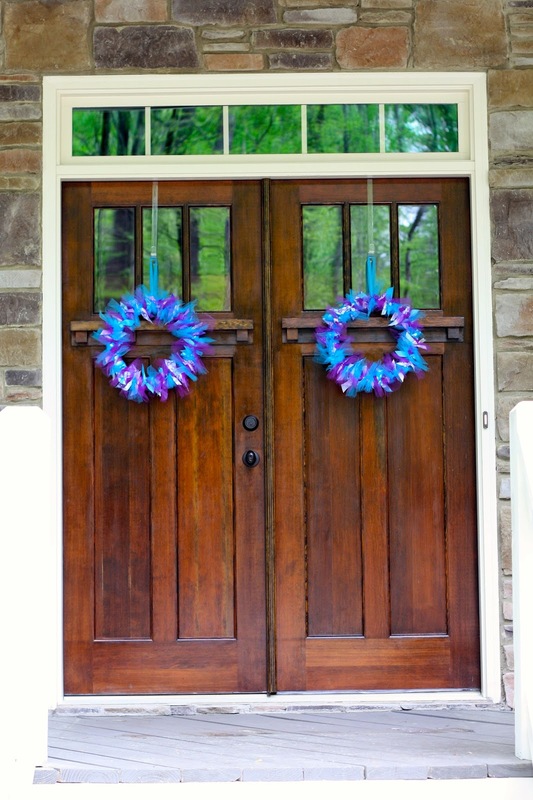 Then I got a little carried away and wanted to make wreaths for the front doors, which would have been totally fine except I was making ribbon/tulle wreaths and they take forever!!! I forgot about that because the last time I did one was years ago. I got half-way through and totally regretted starting, but I was already that far along so I just decided to keep on keeping on. They turned out cute and she loves them, so that made it worth it. They are so simple to make... they just takes a lot of time. 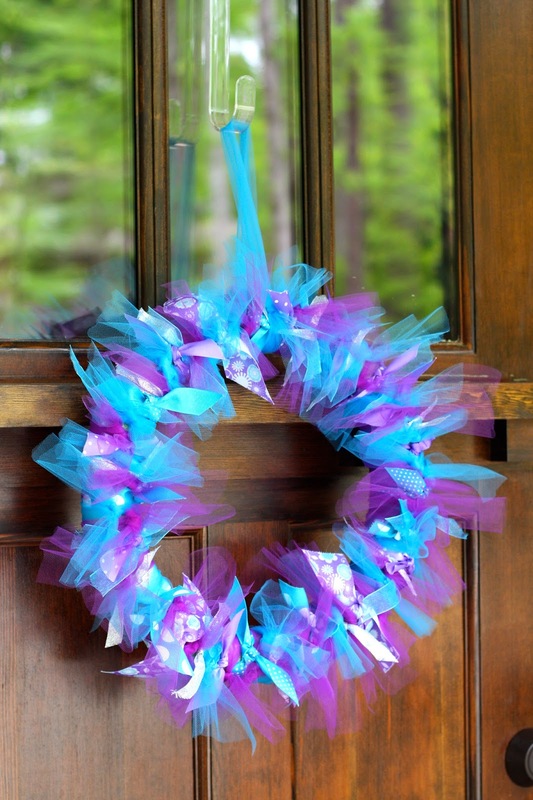 To make some of your own, use a foam wreath form, cut and tie ribbon and/or tulle around it, alternating colors, until you make it all the way around. 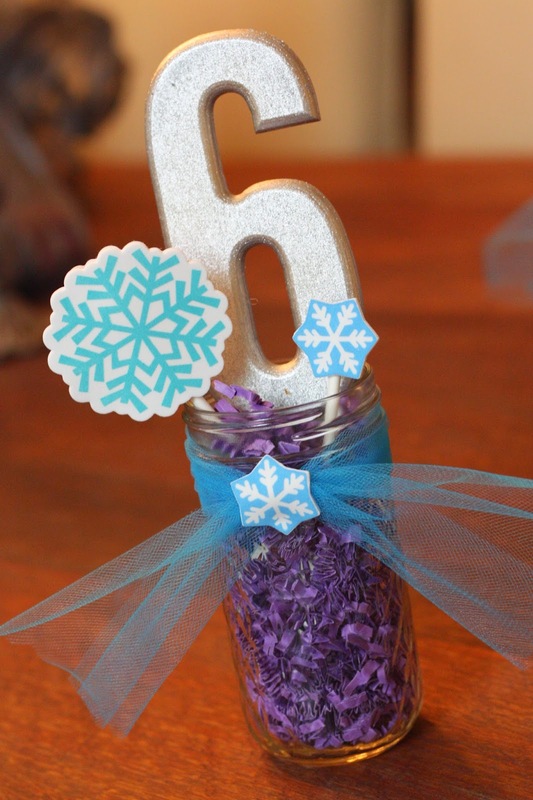 I also made some cute little centerpieces to use on some of the tables. I just got a few wooden "6" cutouts from the craft store and spray painted them silver. I also found a package of snowflake foam stickers which are perfect. 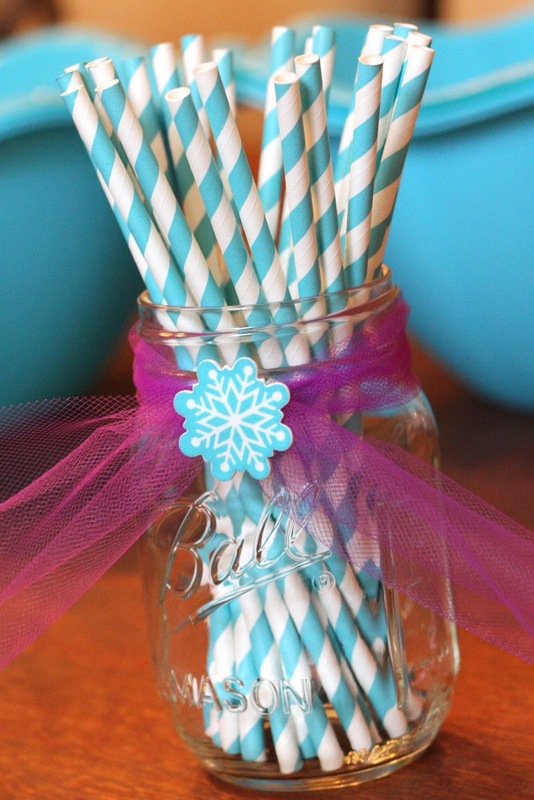 I hot glued everything onto lollipop sticks, stuffed some paper shreds in a mason jar and stuck everything in. Speaking of the paper shreds the package came from the Dollar Tree. Y'all have got to check there next time you are planning a party because I found so many great things there for, you guessed it, only a $1!!! That's also where I got these buckets. I think they were actually supposed to be for Easter, but I figured they would work perfectly for the snowball toss game I was planning. The leftover tulle has been put to good use. I'm tying it around just about everything and adding those foam snowflake stickers, too. Super easy, but adds a little something to basic pieces to pull the theme together. I have some fun and easy food ideas planned, but one thing I will be making are the dipped rice crispy treats like Jen shared HERE. 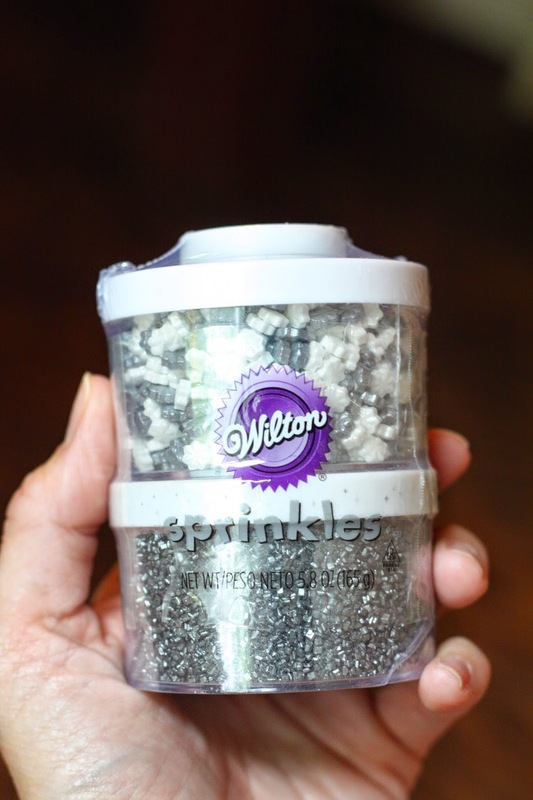 Only I am using blue chocolate and I found these perfect snowflake sprinkles! I'm excited about her party and can't wait for all of the planning to come together so she will feel loved, celebrated, and special. The party is at our house, which is fun, but always stresses me out a little. Earlier this week they were calling for rain all day, but now it's looking like it might be OK. Let's all just pray that it doesn't rain because if it does that will mean almost 20 kids stuck in my house making a huge mess! Yikes!